This was an unplanned walk. By some divine favourable alignment of the planets (or just plain good luck), I had 2 days to myself at short notice and a cracking weather forecast. A quick perusal of my Wainwright count highlighted 5 fells in the far western region which needed my attention. Further scrutiny of the area on my beloved lake district raised relief map suggested a possible route to link them all together and a final examination on the OS map sealed the deal. And so early on Monday morning I headed off to the Ennerdale valley, parked near Crag Farm House and set off along the most direct route to Grike up the steep Ben Gill path. This is also the path up to Crag Fell but about 2/3 along the way a stile in the fence gives access to the grassy slopes of Grike. There is no obvious path and so it is simply a case of wandering steadily upwards over a featureless terrain of tussocks until finally emerging onto the broad summit plateau where a large pile of stones and a wind shelter indicate the highest point. 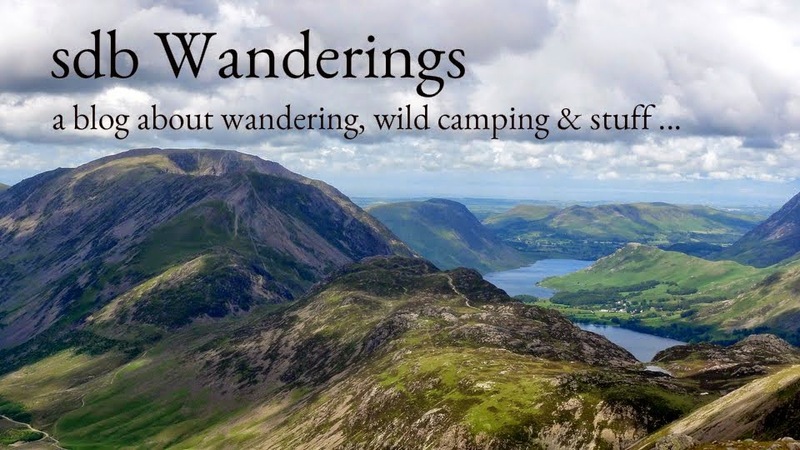 Being the most westerly of the Wainwrights, Grike benefits from largely uninterrupted views out to the Irish Sea whilst also offering tempting views of the larger fells further inland. A direct path then links Grike to Crag Fell, which from this side appears to be another featureless grassy mound but when viewed from Ennerdale Water, is an impressively steep rocky bulk dominating the southern shore of the Lake. Once on the summit, the 'craggy' part of Crag Fell becomes more apparent and then a stunning view opens up revealing the full length of Ennerdale Water with Great Borne and the High Stile ridge as the backdrop. A real jaw dropping panorama worthy of rucksack removal, a seated position and 20 minutes of quiet reflection. Having quietly reflected, I reluctantly left Crag Fell with a mental note to wild camp there sometime. The next fell on the radar was Lank Rigg. From here, it seemed a long way off, and its shallow grassy mound of a profile without a rock in sight wasn't terribly inspiring. It was indeed a long slog from Crag Fell over Whoap to Lank Rigg although the otherwise dreary walk was made considerably more interesting by the activity of the Forestry Commission. Clearly there had been a large expanse of trees (probably non-native pine) between Crag Fell and Whoap which had recently been felled, creating a scene of strange desolation. I would imagine this is part of the project to re-wild some areas of Ennerdale which is something I strongly approve of. It must have been a strange & unnatural sight to see a huge glade of mature trees in this area and although I obviously stumbled across this region in a state of transition I would hope that the area will look fully naturalised again in a few years. Lank Rigg summit is apparently a place of buried treasure, there being a tradition of leaving coins under one of the cairn stones near the trig point. A quick inspection of the most appealing candidates was unrewarding so I wandered over to the 'other summit' further west and found a nice spot sheltered from the cold easterly to have lunch. I hadn't seen another person since leaving the car and had just skylarks and the occasional sheep for company. My next destination was Caw Fell. The direct route was tempting but would involve traversing an unseen valley/stream on a pathless route over likely marshy ground and losing considerable height in the process. The alternative was to retread my tracks back to Whoap and then join the slowly rising ridge up to Iron Crags and then Caw Fell, which was longer but on a good path and without significant height loss. I opted for the latter. It was certainly a long walk but once on Iron Crags the views open up over the whole ridge from Caw Fell to Pillar. Stunning scenery, and really quite amazing that despite the popularity of fell walking in the lakes, I seemingly had this whole area to myself. From Iron Crags, it is a steady uphill stroll onto the long summit plateau of Caw Fell. At first it is not obvious where the highest point is but a few cairns and a wind shelter soon come into view westwards and so over I wandered, and then further on to another large cairn complete with antenna like ironmongery which seemed like it might be higher. This was the best spot for coastal views but looking back, the other cairn was obviously higher. I presume cairn hopping is also a familiar past-time for fellow peek baggers keen to stand aloft the true summit of any fell. Lank Rigg from Caw Fell - and wondering whether I should have taken the direct route? I had originally planned to camp on Haycock summit but a glance along the ridge to its seemingly rocky bulk, a downwards glance at the soft grass of Caw Fell, followed by a 'self diagnostic' of stamina and a time check computed that I should start looking for a camp spot. This decision was further reinforced by the inviting dry stone wall running along Caw Fell which would provide adequate shelter from the biting easterly wind. A wander along the wall in the direction of Haycock soon revealed a nice flat stone-free spot with views of the Scafell's. Perfect ! Tent pitched, tea (or 'dinner' if one is of a certain upbringing) on the boil and I settled down to watch the lengthening shadows creep up the Scafell's followed by a glorious sunset over the Irish Sea and then a full moon emerged over Scafell Pike. This is really what wild camping is all about. It's difficult to put into words but arranging the following adjectives into a meaningful sentence gives some idea, at least for me; inspiring, majestic, isolated, exposed, privileged. And then depending on the weather; tranquil, reflective, anxious, intimidating, frightening but always (for any American readers) Awesome! I slept well after watching 'Crash' on the phone followed by a therapeutic amount of single malt whiskey. It never became fully dark due to the full moon but increasing light levels in the early morning indicated it was time to get up and get some breakfast on. It was a bitterly cold morning with frost on the tent so I wasted no time in packing up and getting moving so as to warm up. I had been walking for just 10 minutes when the sun rose over Scoat Fell, painting the landscape in that familiar orange glow. The walk towards Haycock is a gradual transition onto more rocky terrain. A slight diversion off the main path up onto Little Gowder Crag is well worth the effort for the views down to Ennerdale Water. After bagging Haycock, the highest Wainwright of my planned route, it was time to head back. I had momentarily considered going on a little further to Scoat Fell & Steeple but being a little pressed for time, and having previously climbed them, I took the main path down over Tewitt Howe to the Ennerdale valley before walking the length of Ennerdale Water back to the car. Perhaps it was the unexpected and hastily arranged nature of this walk which made it so enjoyable but the perfect weather was also a considerable bonus. And so the Wainwright count now stands at 128 and the next planned venture back to Lakes is early May. Here's hoping my luck with the weather holds. Food : Fuizion Chicken Tikka Masala, Buttered Bread, Supernoodles,various sugary snacks, coffee, cup-a-soup. Clothes : Base layer = Rohan Ultra Silver long sleeve T (95g) & leggings (80g) (used in sleeping bag instead of a liner), Ron Hill wicking T-Shirt, ME Astron Hooded jacket (400g), Sprayway Challenger softshell trousers, Montane aero cap, ME beany, TNF 'E Tip' gloves, sunglasses, Buff, Bridgedale socks. Thermal = Montane prism 2 jacket (423g) - doubles as a pillow when packed into its own pocket. Shell = ME Firefox jacket (320g) & trousers (295g).